Ghana international goalkeeper Adam Larsen Kwarasey has signed for Major League Soccer side Portland Timbers on a long-term contract. The 26-year-old, who has played 21 times for the Black Stars, joins from Norwegian team Stromsgodset ,where he began his career in 2007. He made 154 league appearances for the club and was captain in 2013 and 2014. 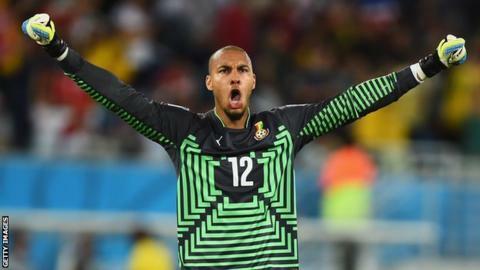 Kwarasey was the first-choice stopper for Ghana at the 2012 Africa Cup of Nations. And he made one appearance at the World Cup in Brazil in the summer - a 2-1 loss against the United States in the opening match of Group D.